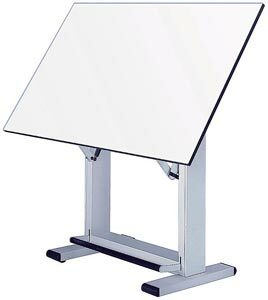 For the professional who demands a lot from a drafting table, but whose working space is limited. The white melamine board is balanced by adjustable compensatinf springs. The incline and elevation movements are simultaneous, angle adjusts from 0 degree to 85 degree. Height adjusts from 38" to 45" in horizontal position. It also features a rigid balanced metal frame and friction locking footrest for comfort. WARNING: This product contains Formaldehyde, known to the State of California to cause cancer. For more information, go to - www.P65Warnings.ca.gov. Oversized item, regular shipping cost does not apply. Customer will be notified of corrected shipping cost.